What games are best enjoyed in the arcade? So the headline here is sort of a rhetorical question – we all know what works best in arcades and what doesn’t, but we may as well discuss the subject thanks to this link that the Stinger Report sent along to us. The article starts out with the seemingly obligatory shot at arcades being dead, etc. etc. but then goes onto talk about why fighters, shooters and DDR are all better at the arcade then they are at home. I don’t think we can find anything to disagree with on those types of games as there is a good reason as to why those types of games (& racers) are almost exclusively produced by arcade companies year after year. 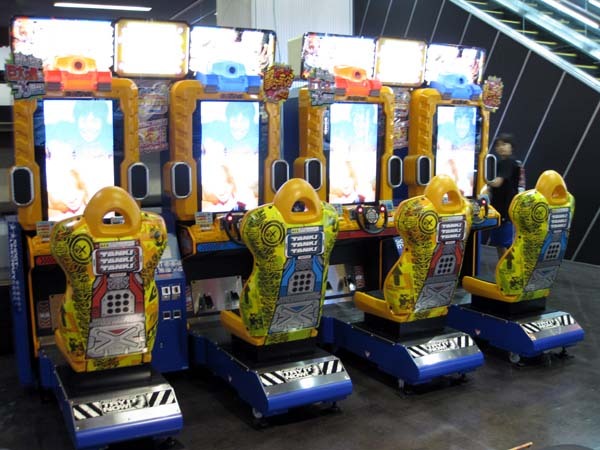 Granted I personally feel that there are other kinds of games that can work better in arcades and I have written about such games before when I did my Missing in Action articles a while back. For starters anything that involves the player controlling a gigantic war vehicle such as tanks, planes or mechs takes the top prize when it comes to arcades and if you don’t believe me then I suggest you find a T-Mek arcade machine and give that a go. Also games like Blazing Angels or the upcoming Tank! Tank! Tank! show off why these games are more enjoyable in the arcade than at home. Related to fighters are brawlers or scrolling fighters if you prefer. These games have always been specially tailored to coin-op format and while I do occasionally enjoy playing these at home, it’s just better in the arcade, especially when you are joined by a couple of friends and the need to stay alive so you save your quarters as much as possible heightens the excitement behind the play. I would also throw pinball in there because of video pinball titles that are still being made for modern consoles today – nothing beats actual pinball and that’s one reason why I am glad to have a couple of pins sitting in my arcade. It doesn’t matter how nice the home video pinball game may be, it will never hold a candle to what a real machine can do which gives players that unique “pinball feel”. Exergaming has the potential to be done better in arcades and obviously DDR plays the biggest role behind that but I think that the envelope could be pushed further than that as long as the right ideas are put into place. Speaking of DDR, Kevin also sent us a link detailing two DDR Enthusiasts in Idaho who use the game to get their workout while having fun. For someone elses take on what can be done better in arcades, click here. Might I be a bit of a contrarian and point out that if arcades actually provided more than just fighting/gun games/racing games more people might go? Personally, I don’t even bother w/ arcades anymore (except for Fun Spot in NH but that’s due to the overwhelming number of older games) and it’s because of the over-emphasis on the same old, same old. There’s nothing quite like the environment of a game that is designed with the experience of the entire package in mind. My thoughts go back to the Discs of Tron environmental cab, and even to older games like Space Tactics, Sky Raider, Gorf, and Space Encounters. When the cabinet is designed to enhance various elements of the game, it’s all the more fun, and not something you can quite get at home with consoles or even MAME.